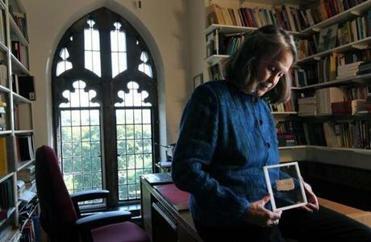 Karen L. King, Hollis Professor of Divinity at Harvard University, in her office with the papyrus fragment in question. The Harvard Theological Review said Monday that it does not plan to print a retraction of Harvard professor Karen L. King’s 2014 paper on the so-called “Gospel of Jesus’s Wife,” now that King said she believes the papyrus fragment she wrote about was probably a forgery. King was persuaded the scrap of papyrus was probably a fake after the Atlantic magazine published an extensive investigative piece last week profiling the owner, a Florida man named Walter Fritz, whose identity King kept confidential. Most of King’s colleagues had already dismissed as a fraud the fragment, which mentioned a married Jesus. But King remained open to the possibility of authenticity until she read the Atlantic’s story, which detailed evidence of forgery in documents that Fritz gave to King, and questioned claims that the papyrus had been examined by Egyptologists in Germany in the 1980s. A Harvard professor now concedes a tiny swatch of papyrus is probably a forgery. Levenson and Madigan noted in their statement that the peer-reviewed journal also published an article by Leo Depuydt, a Brown University professor, arguing that the papyrus was a crude forgery. “Given that HTR has never endorsed a position on the issue, it has no need to issue a response,” the editors wrote. The Harvard Divinity School also updated its website on the “Gospel of Jesus’s Wife” to include King’s comments to the Atlantic following the publication of the article.